The pool temperature as of 5 pm today is 81°. Repairs to the plaster of the indoor pool are complete. It will be filled tonight and temperatures will slowly start to rise tomorrow. The pool will be open Thursday, November 15, however, temperatures will be very low. All programming is cancelled. We will continue to post updates on pool temperatures here, which is the NEWS page of our website. Please check back every few hours beginning Thursday, November 15 at noon. We apologize for the amount of time the indoor pool was down. We realize this amenity is a very important part of many of our members’ workouts. We are grateful for your patience. Swim meet season is upon us. This weekend, the Club will be hosting the Thanksgiving Invitational Swim Meet. In conjunction with the swim meet, we are taking this time as an opportunity to perform much-needed repairs to the plaster of the indoor pool. Please note that the pool temperatures will be slightly lower towards the end of the week and the parking lot will be busier Saturday and Sunday. See below for more information about the pool and hot tub closings. The Thanksgiving Invitational Swim Meet will be held Saturday, November 10 and Sunday, November 11. The pool will be drained following the meet on Sunday with repairs taking place on Monday. The bulkhead will be moved Friday, November 9 at 12 p.m.
Once repairs are complete, we will refill the pool and work towards getting it back up to regular temperatures. Updates will be sent out Monday, November 12 through email, social media, and the Germantown Athletic Club app regarding the pool reopening. Club members can expect to see a few more improvements in the very near future. Phase IV renovations will take place as early as this winter. There are four parts to this project, none of which will interrupt any services. If budget allows, other improvements could be added to this phase of renovations. 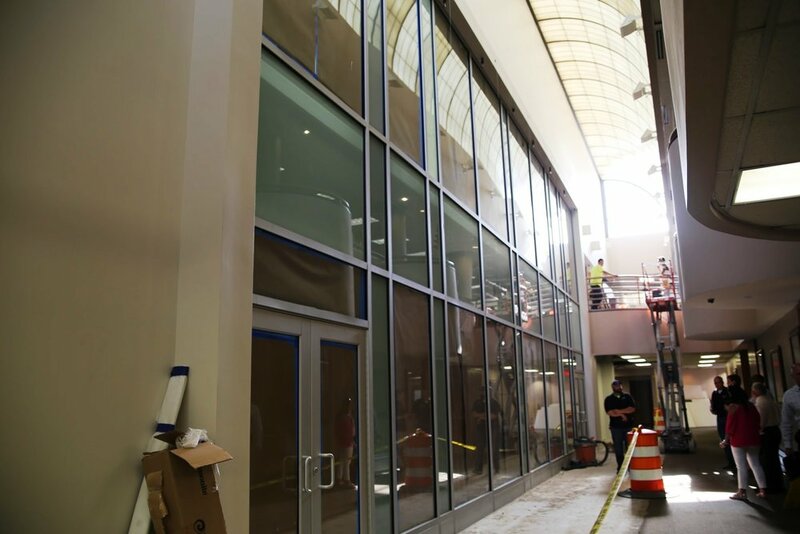 Possible add-ons include renovations to the fitness locker rooms and restrooms off of the Mind & Body Studio, an update to the elevator, or separation from the complex's fire panel system allowing for a stand-alone system. In addition to Phase IV renovations, the Club will be replacing it’s 28-year old cooling tower for the HVAC system and updating the internal security camera system. There’s never been a more exciting time to be a member of Germantown Athletic Club! The plaster in the indoor pool will be getting repaired this week. Due to these repairs, the indoor pool will be partially drained and CLOSED Tuesday, January 9 at noon - Wednesday, January 10. These repairs should be short and sweet. We are planning on filling the pool back up Wednesday afternoon to be ready for regular hours Thursday, January 11. The hot tub will remain open. Lil Gators, swim lessons and Germantown Gators Swim Team practices will be cancelled. All water aerobics classes will be cancelled Wednesday. The Club will host the High School/Middle School Swim Meet this Saturday, January 6, 8 a.m. to 5 p.m. A few important reminders are listed below. The bulkhead will be moved approximately at 12 p.m. Friday. Pool temperatures will be lower towards the end of the week. On Saturday, the pool will be open to members 7 a.m. to 8 a.m. and 5 p.m. to 9 p.m. It will be closed to members during meet hours. The hot tub will close Friday at 4:30 p.m. and reopen after the meet. Thank you for your patience and Go Gators! Child Care will close at 12 p.m. and reopen at the regular time of 3:30 p.m. The Aquatics Ladies Locker Room and restrooms off of the Mind & Body Studio will be closed. The Aquatics Family Changing Rooms and Kids Locker Rooms will be open for changing only. Access to sinks, showers and toilets will not be available in these areas. Please use the locker rooms located in the Weight Floor area during this time. The City's annual Holiday Parade will take place Saturday, December 9 at 2 p.m. Road closures will be in effect for Kimbrough, Farmington and Exeter between 12 p.m. and 4 p.m. Access to the Club during this time will be at the entrance off of Neshoba near GPAC. In addition, floats will be disbanding in the GAC and GPAC parking lots. The rain date for this event is Sunday, December 10. For more information about the City's Holiday Parade click here. Les Mills RPM™ is coming the week of November 12! Launch classes will be announced soon but you have the chance to preview RPM™ Wednesday, November 8 at 10:40am or 5pm. Join Jessika and Christina in this 30 minute RPM™ Xpress class. LET US KNOW YOU'RE COMING by commenting below. If you would like to bring a guest just email us before Tuesday, November 7. Space is limited to 45. We are adding one more Les Mills class format to the group fitness class schedule! RPM™ is a group indoor cycling workout where you control the intensity. It’s fun, low impact and you can burn up to 675 calories a session. The instructor training for RPM™ is this weekend. YOU ARE INVITED to the RPM™ Master Class this Saturday, September 9 at 8:45 a.m. All other Cycle classes are canceled Saturday, September 9 - Sunday, September 10. Join Les Mills National Trainer and Presenter, Shelley Barber while she takes you on a journey of hill climbs, sprints and flat riding. This class is also part of our instructor training so there are limited spots available. This is a MEMBERS ONLY event. To secure your spot, comment your first and last name below the video. We will take the first 30. Walk ins will be allowed if there are no shows/cancellations. RPM™ is the world's leading group indoor cycling workout. Join the pack and ride your road to cardio fitness. A 45 minute RPM workout is all about cardio peak training. You feel the rush as you burn those calories, with fresh tunes, motivating instructors, and proven results. The plaster in the indoor pool is getting repaired this week. Due to these repairs, the indoor pool will be drained and CLOSED Wednesday, August 23 - Saturday, August 26. The outdoor pool will assume indoor pool hours of operation. Splash Park hours remain the same: Weekdays, 3-7PM and Saturday, 10AM-7PM. All water aerobics classes will move to the outdoor pool with the exception of the Wednesday 6:15PM Aqua Fit class. This class is cancelled. Swim Lessons and Lil Gators will move to the outdoor pool. Swim Team will have a revised schedule outdoors. Visit the GST website and Facebook page for the revised schedule. As part of our continued commitment to make Germantown Athletic Club the best health club in the area, we will begin Phase III Renovations the week of August 21. This phase will take approximately five months and will result in a renovated upstairs lobby area, larger men's aquatics locker room, new staircase and HVAC upgrades throughout. Initially, a temporary wall will be built similar to the one in Phase II. Traffic will access the right side of the downstairs hallway. This wall and other parts of the renovation will prevent access to the upstairs lobby, men's aquatics locker room, upstairs bathrooms and back stairwell. Family changing rooms, the boy's locker room and the men's fitness locker room will be available in place of the men's aquatics locker room. Multipurpose Room 2 (located across from Basketball Court 2) will be the temporary coffee and lounge area. All customer services will take place at the check-in desk. We are excited about the upcoming renovations and will do everything possible to prevent any interruption in the services we offer. Thank you for your patience as we continue to make improvements. In preparation for the Les Mills BODYPUMP and BODYFLOW launch in September, we are hosting a BODYPUMP Masters Class this Saturday, August 19 at 9 a.m. Join Les Mills National Trainer and Presenter, Shelley Barber, and sculpt, tone and strengthen your entire body in this intense barbell class. Burning calories at GAC just got real! The touch screen consoles on the Precor cardio equipment just received the latest upgrade. Now you can binge watch your favorite shows on Netflix or Hulu while working out. The upgrade also includes access to WatchESPN, Spotify and iHeartRadio. A personal login and password for these apps will be needed for access. The instructions on the console are easy to follow and can be completed in just a few minutes. This short video will show you how. Another new feature in this update is Single Sign-On. Once the account login and password are entered for your personal audio and video entertainment accounts, this won’t have to be done again during future workouts. A single sign-on to start the workout is all that is needed. Additionally, you can easily manage your logins and passwords through a new feature on the console called My Profile. While the update will make new ‘app tiles’ visible on the screen for each of the available entertainment apps, it does not affect how you sign onto your Precor personal account. Say hello to Madison McVay, NASM Certified Personal Trainer. Madison has a strong passion for helping others reach their fitness goals. Definitely deadlifts. It really allows me to push my limits. I have an extreme desire to be the best at whatever I'm doing. What person has influenced you the most? My mom, hands down! She raised me on her own. I like to play basketball and workout. Name 3 songs on your workout playlist. I'm not sure of the names of the songs but the artists are DMX, Motionless in White and Kendrick Lamar. The Club will be fairly busy over the next few weeks. This week, all new cardio is getting installed onto the cardio deck. Once the new equipment is in place, the cardio equipment on the Fitness Area/Weight Floor and upstairs will be removed. Beginning Friday, June 30, the Weight Floor/Fitness Area will close for upgrades and maintenance, and the majority of the equipment will be moved onto Basketball Court 1. Members should be able to resume workouts later that afternoon in the temporary space. The Weight Floor/Fitness Area will be closed until July 14. We will be cleaning this area thoroughly, painting, removing electrical tracks and replacing flooring. Because the temporary Weight Floor/Fitness Area will be located on Basketball Court 1 we will be down to only one court. A revised schedule for basketball court availability is posted on the Court 2 doors. We are so excited about the new equipment and the new look of the Weight Floor/Fitness Area. We realize new equipment and a new layout might be difficult at first. Staff will be readily available to assist you in the process. Ahhh..... Phase II Renovations are complete and we have been overwhelmed with positive feedback from our members. 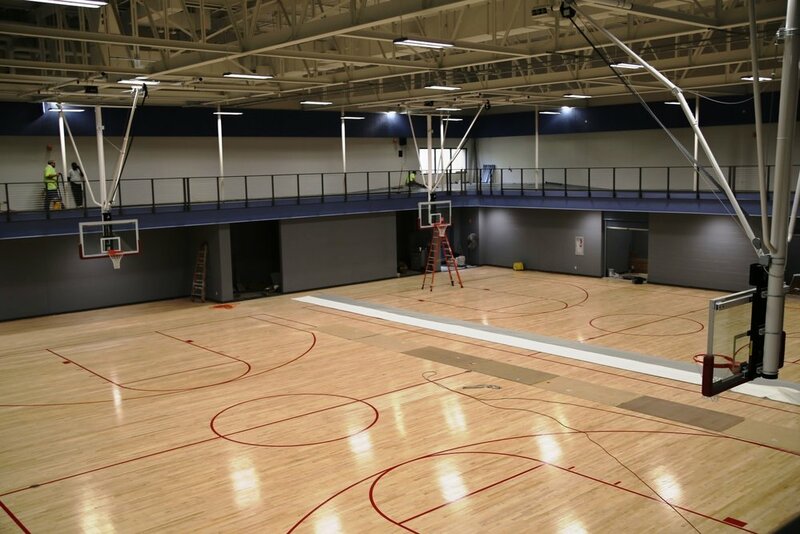 If you haven't had a chance to attend a class in the new studio or shoot hoops on the new courts you are missing out! Although renovations are complete, we still have a very empty cardio deck overlooking the basketball courts and we need to fill it up! That being said, the last week of June, all new cardio equipment will arrive. Keep in mind this is cardio only, not strength. All strength equipment will remain. In addition to your favorites such as Precor treadmills, recumbent bikes, adaptive motion trainers and ellipticals, we will be introducing four new types of cardio pieces. Take a look at the videos below. This cardio installment is going to be BIGGER and BETTER than ever! We've increased our cardio offerings by 40%. The personal viewing screens are larger, and the user can have a more personalized workout with the new Preva technology. You'll even be able to check your Twitter account during your workout. Part of the new cardio installment also includes 45 new Stages indoor cycles and power meters for the Cycle Studio. Once the cardio equipment is installed on the upstairs cardio deck, the fitness area (weight floor) downstairs will close for two weeks. Most of the weights and strength machines will be moved onto one of the basketball courts and will be available for use. The downstairs fitness area will get a fresh coat of paint, the electrical tracks will be removed and it will be thoroughly cleaned. There will be a completely different look and feel to this area when we reopen! This will take place June 30-July 14. Whew! That's a lot to take in. Looks like the rest of our summer is going to be busy. We are so very close. Members are just starting to get a glimpse of what has been going on behind the temporary wall and the excitement is building. 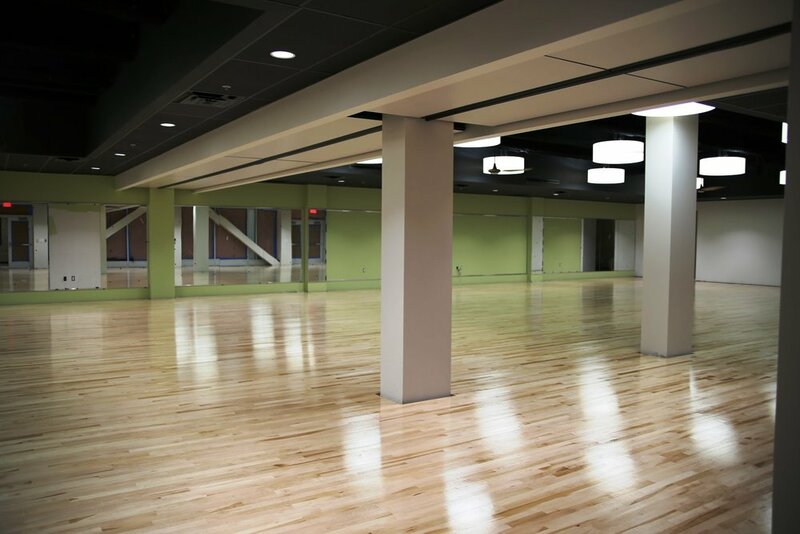 Our group fitness studio will be the largest in the area with the option for it to be divided into two spaces by a vertical retractable wall. This new space will also include a projector and screen for each room allowing for the addition of virtual classes in the future. And...no more class reservations! 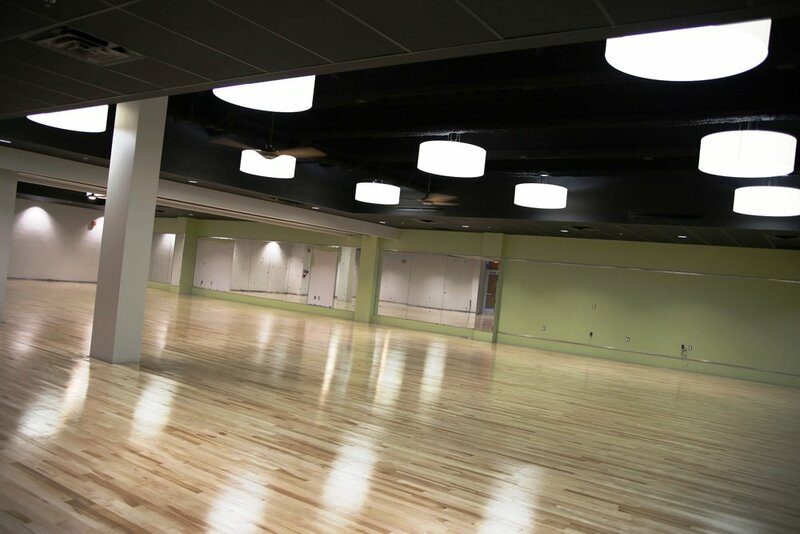 The cardio deck, located above the group fitness studio(s), is over 3,500 sq. ft. and will be the new home for most of our cardio equipment. Once the new cardio equipment arrives in July we'll have an entirely new layout in the downstairs fitness area. The basketball court floors have been refinished and striped and new goals have been installed. This area looks amazing! We are still slated to be in these areas by the last week of May. Thank you for your patience. It will be worth your wait! Beginning Tuesday, April 11, a section of the hallway outside of the Mind & Body Studio will be closed over the next two weeks due to ductwork and steel installation needed for Phase II Renovations. This will affect those who attend classes in the Mind & Body Studio and Cycle Studio as well as those who use this area to walk. A revised class schedule will be in place beginning Tuesday of next week. Hard copies are available at the Club. Please download the app for the most up to date class schedule information and important notifications. Class participants will be entering and exiting through the side door of the Mind & Body Studio closest to the elevator. Modifications to the schedule were made so that classes in both studios could be offered at the same time in an effort to avoid Cycle class participants entering or exiting through the Mind & Body Studio during a class. Over the next couple of weeks please allow additional time for Child Care check-in and group fitness class transitions. Please arrive early for classes and leave promptly when class is over. We appreciate your patience as we work towards the end of Phase II Renovations. We're almost there! Download the Germantown Athletic Club app or visit the FITNESS page to view the revised schedule.